Pour it on a cotton pad (these square ones are my favorite) to soak off mascara, then swipe all over face to remove makeup. Much better for your skin than traditional makeup wipes, which leave behind a chemical film. 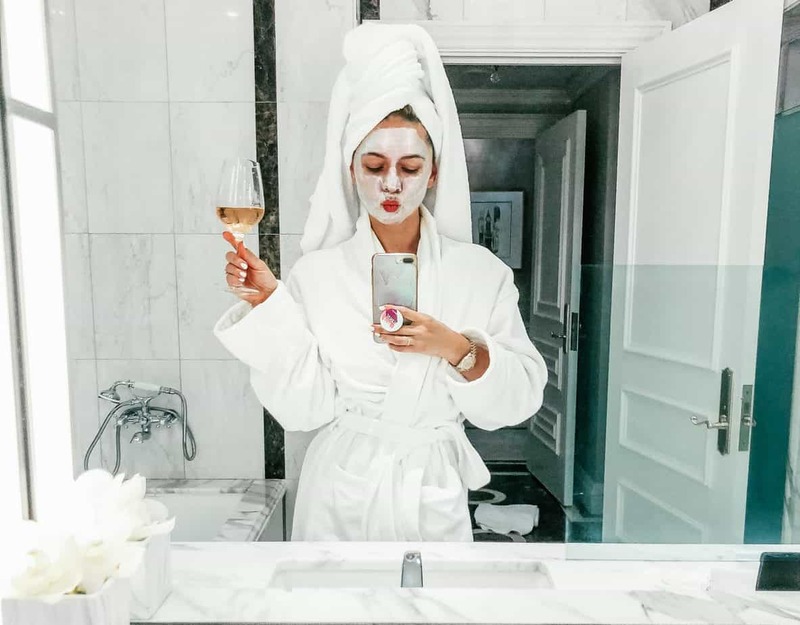 Most experts will tell you that the cleanser you use is the least important aspect of your skincare routine, and also the product you should spend the least amount of money on. I prefer to stick with cream cleansers vs foams or gels (which tend to strip the skin.) Cetaphil—or anything you buy at the drugstore—works just fine. Even if you think you’ve removed all of your makeup, you probably haven’t. A quick sweep of this toner will guarantee there’s not a single thing left on your face. You guys know I’m obsessed with these—they’re one of my “hero” beauty products for a reason. I consider them to be worth every penny and then some. I PROMISE. Everyone I recommend them to tells me that they notice a difference in their skin after using them ONE TIME. I like to use mine twice a week at night, after I cleanse but before I apply my creams and serums. This is one of my favorite super rich, super luxe feeling night creams. (Matt is obsessed with it too—it’s the only moisturizer he’ll use.) The texture reminds me of some of my more expensive products, but it’s way more reasonably priced. This is a great affordable eye cream option that actually works and isn’t irritating. It even has a peachy tint that helps conceal undereye bags. You can use it in the morning before your makeup, and at night before you go to sleep. Previous Post Do Jade Rollers Actually Work? Next Post Planning Your Honeymoon? Read This First. Hi Lindsay, Thanks for sharing your routine How does your morning routine differ? Maybe a post on your mom’s morning and evening skincare routine for us 50+ ladies. I ordered the alpha beta peel pads two weeks ago and am obsessed. Now I just ordered the Bioderma Micellar Water and First Aid Beauty Ultra-Repair Hydra-Firm Sleeping Cream. HOW GOOD ARE THE PEELS THOUGH?! Now you probably understand why I don’t shut up about them haha you’ll love the other stuff too, promise! Last I heard there was drama with the founder after they had been bought by Estee Lauder!